The pool is not huge, no place for the third largest land animal on Earth to hide. But in truth, it is hard to see the animal with only its tiny eyes ears and nostrils breaking the surface of the water. 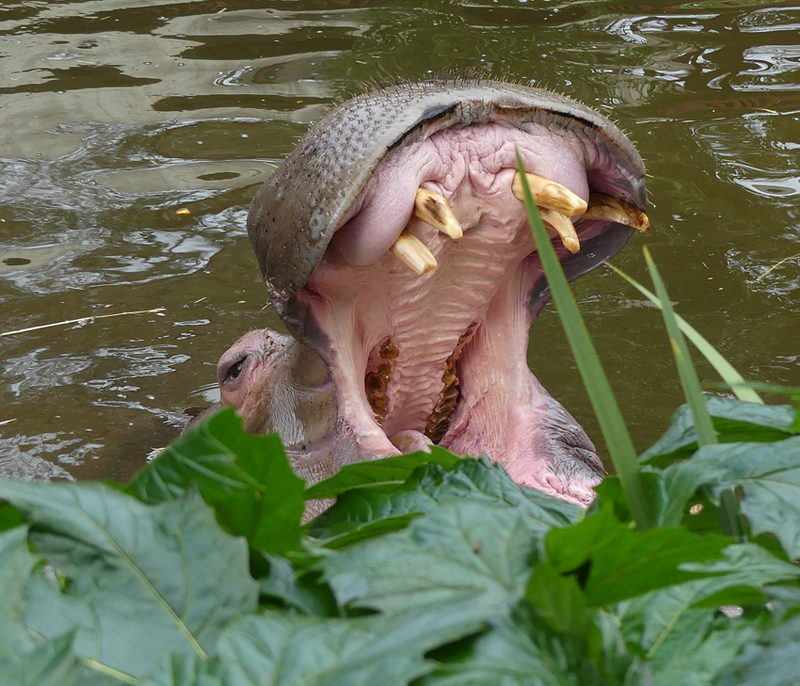 Suddenly the massive head emerges and the hippo’s immense jaws open, revealing broken tusk-like teeth. The teeth are used for duelling and protection rather than feeding on the soft grasses it prefers. I had to re-visit the hippo enclosure several times to make this image. It is a cold windy day with showers forecast. Not the kind of weather that makes for good nature photography in the field. So, I have decided to spend the morning at the Adelaide Zoo and set myself a photographic task; to capture half a dozen portrait images of mammals. I apologize for temporarily abandoning my usual theme of South Australian wildlife but an occasional foray into the world of exotic species is a nice change. Asian small-clawed otters are social animals that live in the rivers, marshes and estuaries of South East Asia. They are the smallest of all otter species and their name refers to the tiny claws that extend beyond their partially webbed feet. These intelligent little predators are extremely agile in the water twisting and turning in sinuous, fluid movements as they hunt for prey that includes crustaceans, molluscs and fish. The zoo group is a family and the mother ‘Boo’ can often be seen juggling small pebbles, just one example of their playful disposition and an ideal image to capture. 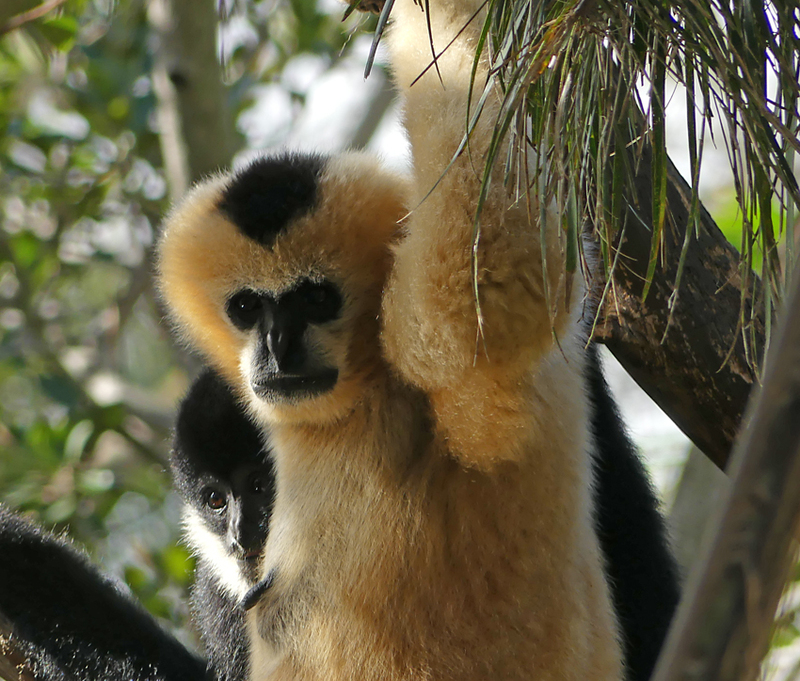 White-cheeked gibbons are small, tree living apes that inhabit the rain forests of Vietnam, Laos and southern China. Habitat loss has made them critically endangered. Breeding these beautiful primates in captivity is one way to ensure that their species does not completely disappear from our planet. Male white-cheeked gibbons are black with splashes of white on their faces. Babies of both sexes are always golden/white then change to black with the females regaining the light colouring when they reach maturity at around five years. The image of the infant peering around its mother’s body seems to exemplify the vulnerability of these endangered animals. Gibbons might be apes but mandrills are monkeys. 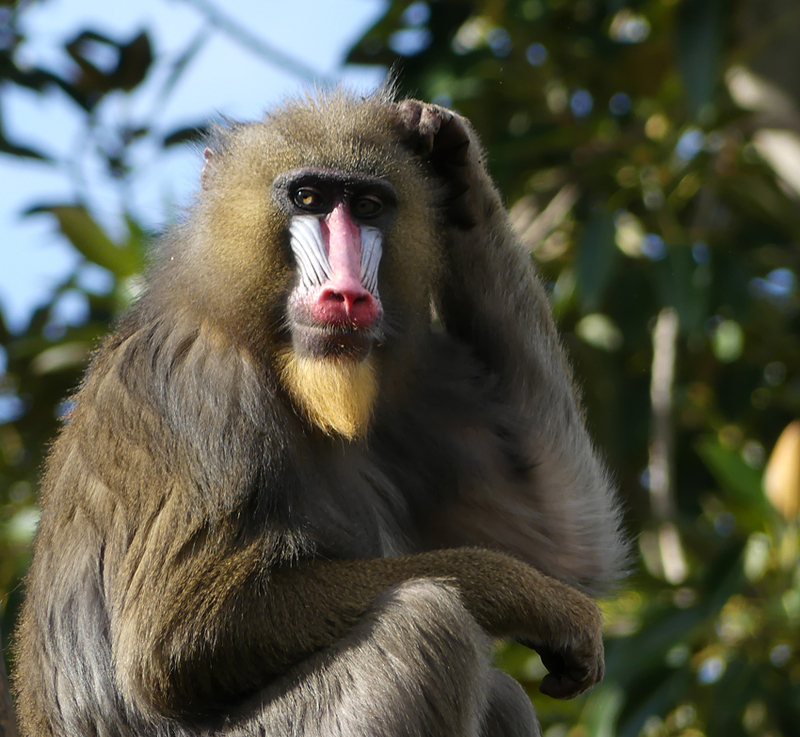 Monkeys have longer faces, tails in most cases, and often move on all fours with their more dog shaped bodies. Mandrills are one of the largest and most colourful monkey species. 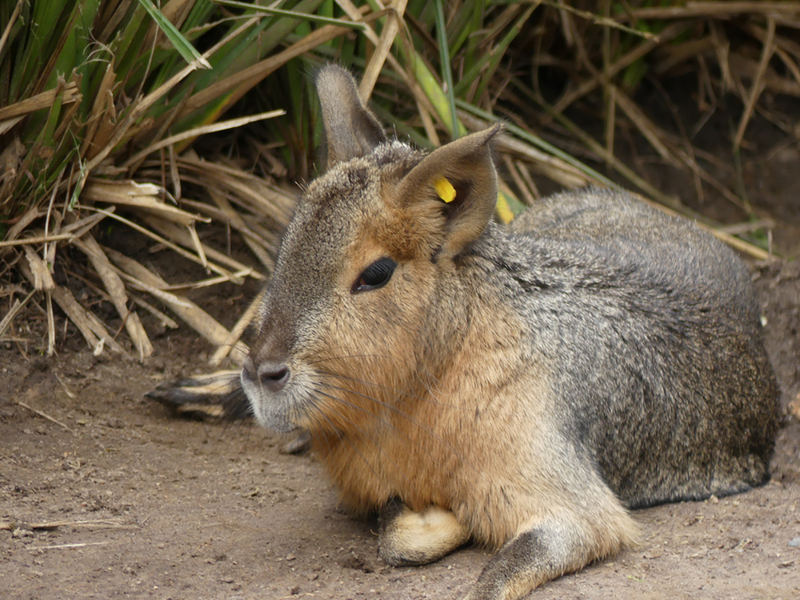 They live in the rainforests and wooded savannahs of Africa and like their baboon cousins have enormous canine teeth capable of challenging predators. They will deter leopards in defence of their groups called hordes which can number in the hundreds. Like all primates (apes, monkeys, lemurs and a few others) they are an intelligent, social species and the rather wistful look on this female’s face reflects this. It would seem inappropriate not to include one South Australian species in my collection of mammalian portraits but neither kangaroos, wombats, Tasmanian Devils, possums or even the usually photogenic koalas were particularly cooperative. 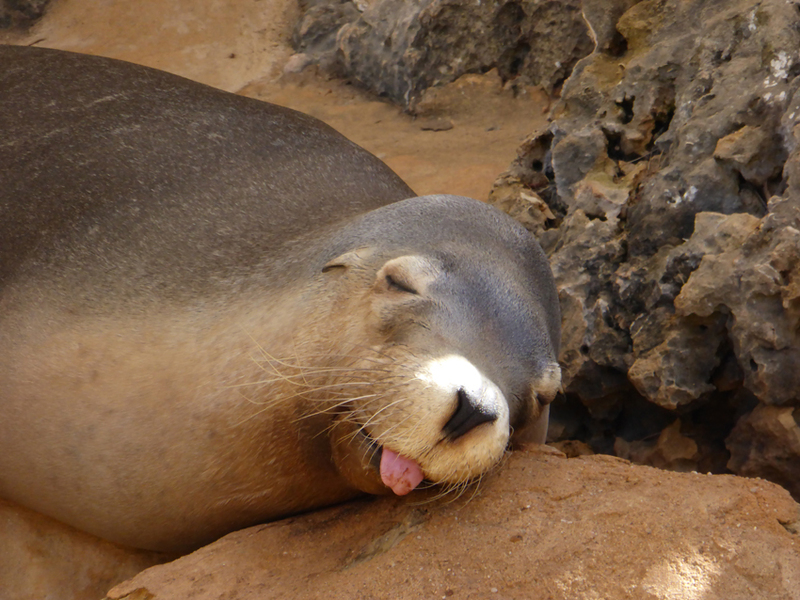 When I had all but given up hope I came across a snoozing Australian sea lion with apparently not a care in the world. A photo opportunity not to be missed. My final image of the world’s largest rodent, the capybara, an inhabitant of the Amazonian rainforests, highlights the ways that zoos approach their captive stock. To monitor animal health, breeding status, age and many other characteristics it is necessary to track them individually. Where animals are numerous, hard to handle or distinguish and for many other reasons visible tags are one useful tool. I have a photo of those teeth too! Love the seal one, looks blissful even resting on that hard pillow. True, I’m looking forward to another visit when the weather improves. Wonderful photos! 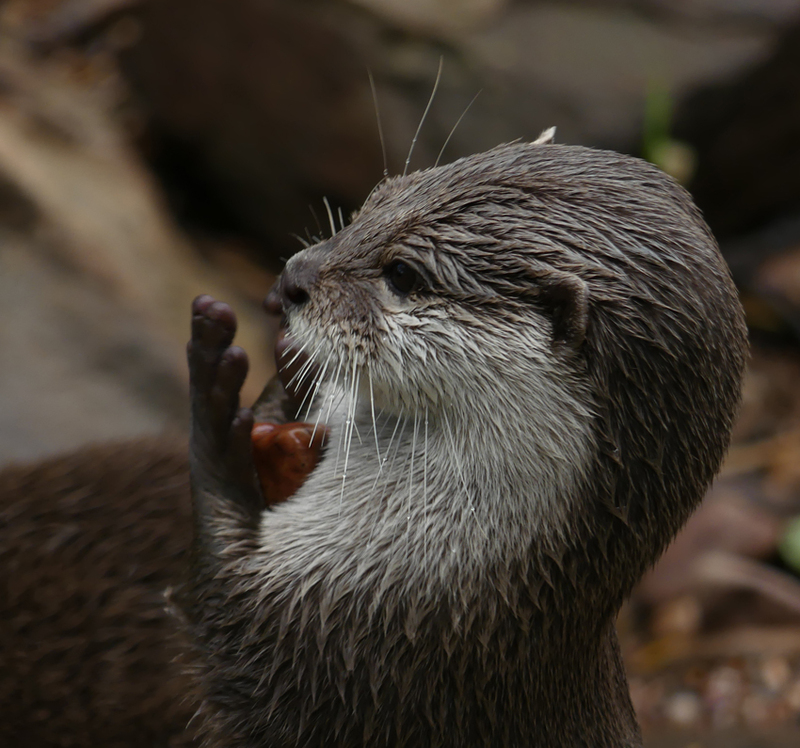 I love watching the Asian small clawed otters, they are so interesting. Love the pic of the sea lion!